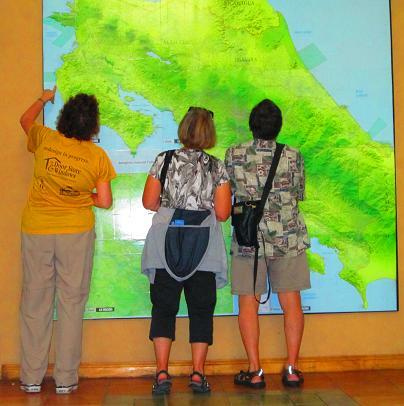 Today we head east toward the Caribbean coast and the rain forest jungle. 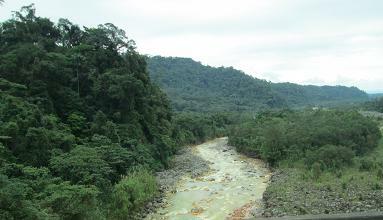 We passed this river, full of water carrying noxious volcano runoff. Doesn’t seem to be affecting the thick vegetation on the left bank too much, though. 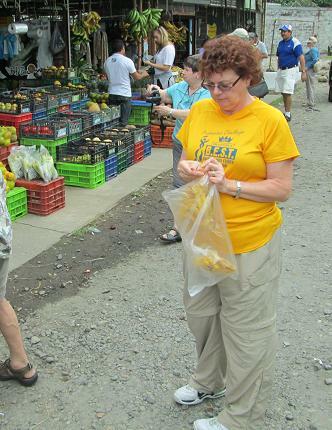 We stop at a roadside farmer’s market. CVH is very curious. 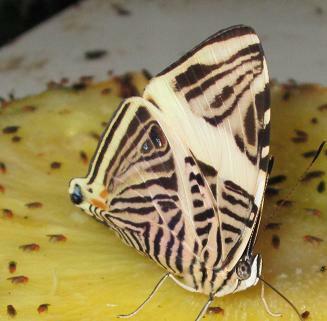 Then we visit a butterfly garden. Lots of butterflies. Very pretty. Very fast and very difficult to catch on camera. This one posed well because it’s dead. Here’s a video with a blue morpho on CVH’s arm. 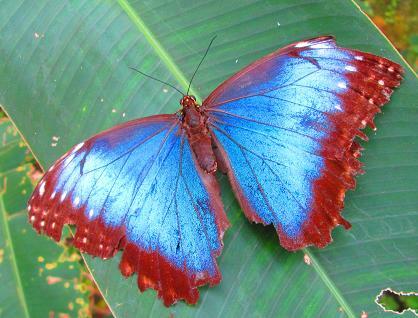 If you look really quick, you can see its blue color when it takes off. 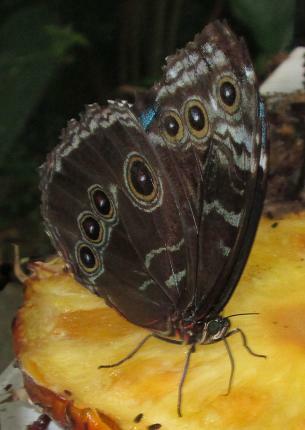 Another quick shot of the blue morpho. At a rest stop, CVH tries to figure out where we are going. She is not pointing to where we are going now, but rather to where we will be next week. Back on the bus, we passed a Chiquita banana plantation. There were a lot of bananas. An awful lot. 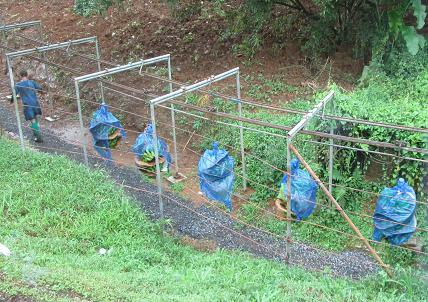 Those that were almost ready to be harvested were enclosed in a blue plastic bag to protect them from harm. Apparently one banana on each bunch has to be left outside the bag for the fruit to ripen properly. This banana, thusly sacrificed, is called the “hero banana”. Here we see the blue bags of bananas being pulled along the “banana train” from the fields to the processing plant.